Triple Paste® was specially formulated to quickly relieve the raw, irritated skin caused by diaper rash, therefore calming and soothing your little one. In addition, Triple Paste’s superior, long-lasting barrier formula stays put, keeping the medication where it needs to be and diaper rash irritants out. Triple Paste allows for fast healing of diaper rash as well as continued relief and prevention. Cleanse your child's bottom, allow skin to thoroughly dry. 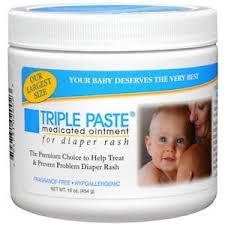 Then heal & protect the area with Triple Paste Medicated Diaper Rash ointment. Apply ointment liberally as often as necessary, with each diaper especially at bedtime or any time exposure to wet diapers may be prolonged. Active Ingredient: Miconazole nitrate 2% Inactive ingredients: zinc oxide, white petrolatum, corn starch, anhydrous lanolin, stearyl alcohol, beeswax, cholesterol, polysorbate 80.